Saturday, April 27, 2019 from 10 a.m. to 4 p.m. Doors Open Guelph is a day-long celebration of Guelph’s finest buildings, creative spaces and artistically or architecturally relevant sites, organized by Guelph Arts Council with support from the City of Guelph, a steering committee and over 100 volunteers. 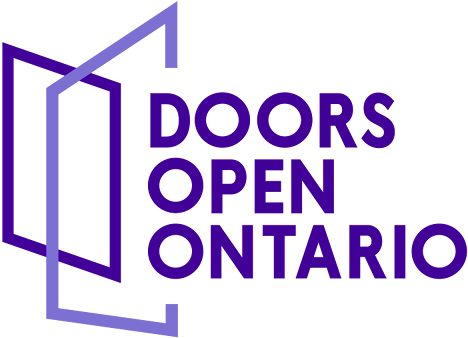 We have the distinction of hosting the kick-off event for Doors Open Ontario, opening the season of Doors Open events. This is a free community event for all ages – and no tickets or registrations are required. Begin at any featured site and visit as many as you like, in any order. Visitors will be led in small groups through the sites by a tour guide who will tell the site’s story. Some sites will feature activities and music. There may be lineups at popular sites, and the last tour typically runs around 3:40 p.m. to allow the site to close at 4 p.m. At busier sites with longer tours, expect an earlier “last tour” and potential lineup cutoffs. This year, Doors Open Guelph will be enhanced by Sharing Guelph’s Stories, an event-within-an-event that will increase the role played by the arts in Doors Open. Visitors can experience dramatic storytelling at the Gow's Bridge with artist Jay Wilson, guided public art and downtown gallery walks, and arts activations at Doors Open sites. Launching the Doors Open Guelph weekend, and Doors Open Ontario season, Guelph Museums’ Doors Open After Dark will celebrate with history and art activations at and around the Civic Museum on Friday, April 26 from 9 p.m. to 1 a.m.
For more information, visit our website or call Guelph Arts Council at 519-836-3280. “That’s so Guelph” is a term used to describe something that is intrinsically Guelph. Whether you’ve said it, heard it or you’re just discovering it, we hope that you will find yourself saying “that’s so Guelph” as you explore the city during Doors Open Guelph. Guelph has diverse experiences waiting to be discovered. There is much to see and do, and how to explore Guelph is up to you. Choose your own adventure with our award-winning festivals, one-of-a-kind events like Doors Open Guelph, incredible public art or the thriving culinary scene. Guelph has something for everyone. Did you know that our Doors Open Guelph volunteers get a front-of-the-line pass to all of the other Doors Open sites? Volunteer either in the morning (9:30 a.m. to 1 p.m.) or in the afternoon (12:45 to 4:15 p.m.) and spend the rest of the day touring incredible architecture and amazing facilities, and hearing intriguing stories! Volunteer roles mostly involve greeting visitors and helping guide them through the space. Site Captains help support other volunteers throughout the day. Training is provided to all volunteers. There will be a brief on site training session for each site, where you’ll have the chance to see the space where you'll be volunteering, get a sense of the tour, meet the other volunteers for that site, and ask questions. On site training sessions are held in early April. Regular volunteer shifts on event day are either from 9:30 a.m. to 1 p.m. or 12:45 to 4:15 p.m. Site Captains deliver materials and install signs at 9 a.m., collect and return them after 4 p.m., and act as liaison throughout the event day. Please note that there will be two general orientation and information sessions to choose from (March 5 and 7, at 5 p.m. at Guelph City Hall). They are not mandatory but are a chance to get a feel for the event and be one of the first to pick your shift! There are also onsite training sessions scheduled for early April to help familiarize volunteers with their chosen site and practise the tour. Volunteers from past events have found the onsite session extremely helpful and highly recommend that volunteers attend their site's session, which typically takes about 30 minutes to 1 hour. Onsite training session dates are listed under each site at the Guelph Arts Council’s website and on the volunteer sign-up page. Doors Open Guelph’s success is due to the enthusiasm and hard work of nearly 200 volunteers who serve as tour guides, sweeps, greeters, counters, researchers, site captains, photographers and more. Join us as a volunteer and help make Doors Open Guelph a true community celebration. Please visit our website to sign up for a shift. If you have any questions, please contact Katie Wilde at administration@guelpharts.ca or by calling 519-836-3280. Saturday: tours from 10 a.m. to 4 p.m.; last tour leaves at approx. 3:40 p.m. Downtown Guelph is home to many galleries, art spaces and public art. During Doors Open, join artist collective Ahmri + Abby and see what you might have been missing. These unique guided walking tours depart from The People and Information Network/Guelph Community Foundation throughout the day. Saturday: tours at 10 and 11:30 a.m., and 1 and 2:30 p.m.
Diyode is a Guelph-based collective dedicated to re-invigorating the do-it-yourself movement. Situated in the former Carson Reid Homes office, the 232-square-metre (2,500-square-foot) workshop contains tools and supplies for wood and metal working, electronics, prototyping and crafting. During Doors Open, Diyode members will demonstrate uses of the tools and workshop areas. Saturday: performances run between 10 a.m. and 4 p.m.; last performance at approx. 3 p.m. Built after to a local population spike, this school - still in use today - was named in honour of the Allied victory that ended the First World War. The school opened in 1919, with an addition made in 1953. Its original brass rails and wooden floors enhance the gracious image presented by its red-brick exterior and park setting.